The Campus Entrepreneurship Enterprise Network (CEEN) presented the National Entrepreneurship Assessment Review (NEAR) project at a workshop lead by the National Teaching and Learning Forum. A workshop titled, Authentic Assessment within and across the Disciplines, took place recently in CIT as part of the Building Capacity Through Conversations phase of the National Forum for the Enhancement of Teaching and Learning's Assessment Enhancement Theme. The purpose of the workshop was to explore the concept of authentic assessment and its implementation within and across disciplines in Irish higher education today. • Consider the enablers and barriers to its implementation within and across different disciplines. The workshop drew upon some experiences and case studies from the National Forum’s Network of Network’s Group and in particular from CIT’s Entrepreneurship Education. The event was hosted by Breda Kenny, Head of the Hincks Centre for Entrepreneurship Excellence and Chair of CEEN (Campus Entrepreneurship Enterprise Network), in Cork Institute of Technology (CIT) Bishopstown Campus on Friday, 25th November, 2016, 10.00-16.00. The Campus Entrepreneurship Enterprise Network (CEEN) presented the National Entrepreneurship Assessment Review (NEAR) project at the workshop. 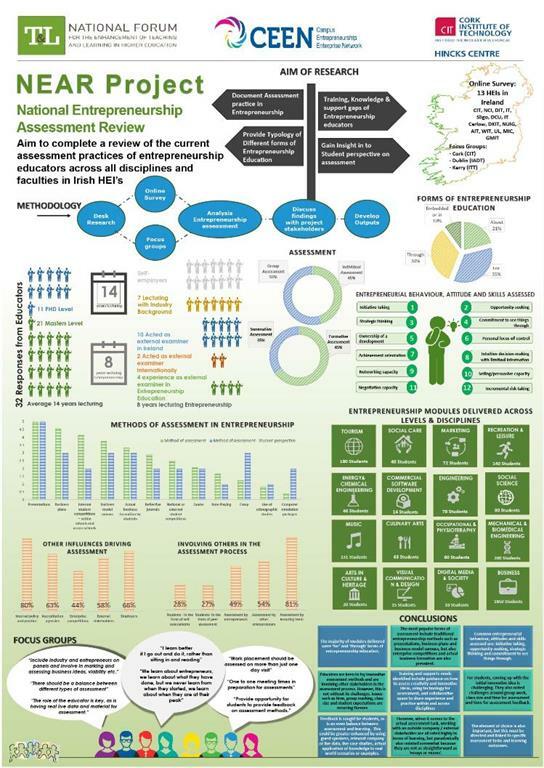 The NEAR project aim was to deliver a review of current assessment practices in entrepreneurship education across all of the Higher Education Institutes in Ireland and disseminate the findings to support entrepreneurship education practices both nationally and internationally. The NEAR research poster can be viewed below.